If you love clipart, you NEED to read this! Did I get your attention? I KNOW there are tons of you out there who share my love obsession for the amazingly colorful graphics that so many bloggers create! I am SO excited to announce to you that there is a HUGE bundle of clipart for an unbelievable price available to you now! Very excited to be a part of the bundle with Educents! I know you will love my TWO products that I donated: My Bright and Shiny Day Papers and my Dots on Turquoise Paper set. They are both so colorful and fun, and I am constantly using them in products! 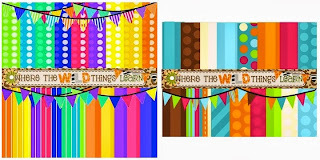 The first product comes with 45 digital papers, and 6 bunting banners! The second comes with 17 papers and 2 bunting banners to match perfectly with the Dots on Turquoise classroom decor set! a Rafflecopter giveaway The deal won't last long so head over now!